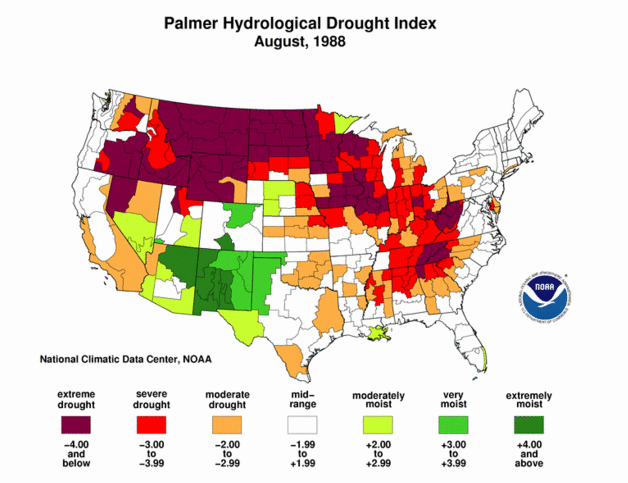 The 2012 drought, which affected more than half the country was the largest drought extent in the United States since the 1930s. It was more extreme than the conditions in 1988. U.S. Department of Agriculture Drought Disaster Declarations reached more than 2,600 of the Nation’s 3,143 counties. 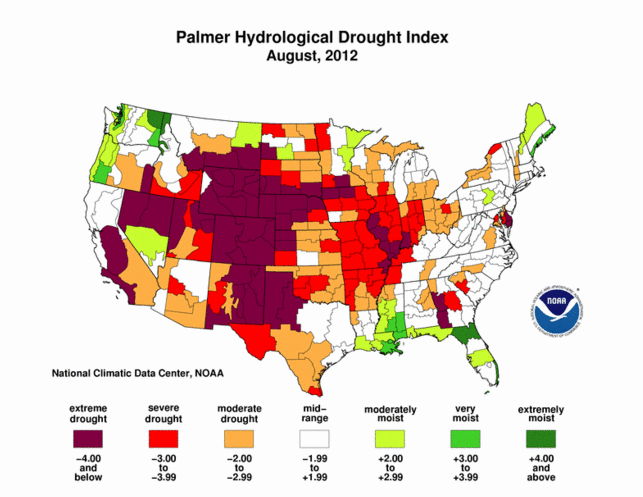 The drought did $30B in damage. The final yield of 123.4 bushels per acre compared to the early USDA forecast of record yields of 166 bushels/acre due to record early planting. 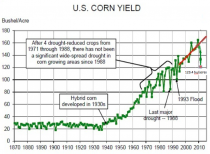 Despite the fact the drought was worse than 1988, yields were 50% higher. Part of that are improved hybrids and farming practices but part is the positive effect of CO2, which produces more growth and makes plants more drought resistant. The 1988 drought in 2012 dollars produced between $80B and $120B in losses. Under conditions of atmospheric CO2 enrichment, plant growth is more vigorous and plant canopies shield the ground from the hot sun, keeping the soil cooler and moister. 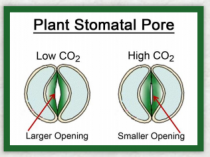 Also importantly, stomatal apertures typically decrease, thereby reducing stomatal conductance and transpirational water losses from plants. Water Stress: When plants are growing under less than optimal conditions of soil water availability, the percent growth enhancement due to atmospheric CO2 enrichment is generally greater than it is when water is readily available to them. Elevated levels of CO2 thus tend to compensate for less than optimal water supplies; and they help plants recover, both more quickly and more completely, when they have experienced a period of severe water stress. This was seen with soybeans, which recovered more than expected when cooler less stressful conditions developed in August. 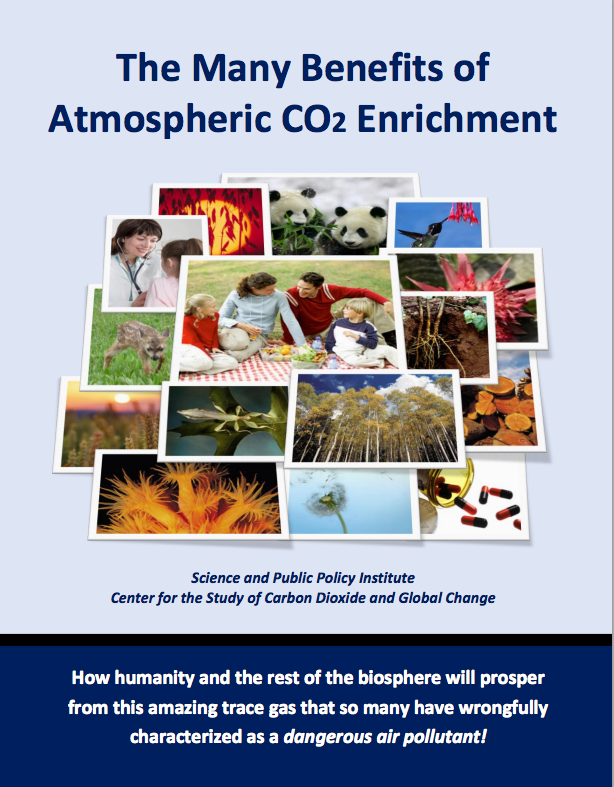 Water Use Efficiency: With higher concentrations of CO2 in the air, greater photosynthetic carbon uptake typically occurs. In addition, less water is lost via transpiration, as many plants exhibit decreased stomatal conductances at elevated CO2. 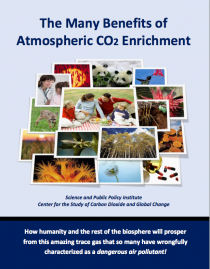 Hence, the amount of carbon gained per unit of water lost via transpiration, or water use efficiency, generally increases substantially with atmospheric CO2 enrichment, sometimes even doubling with a doubling of the air’s CO2 content. In the June WASDE report, the USDA projected corn production down 135 million bushels to 14.0 billion with the average yield projected at 156.5 bushels per acre, down 1.5 bushels from last month. 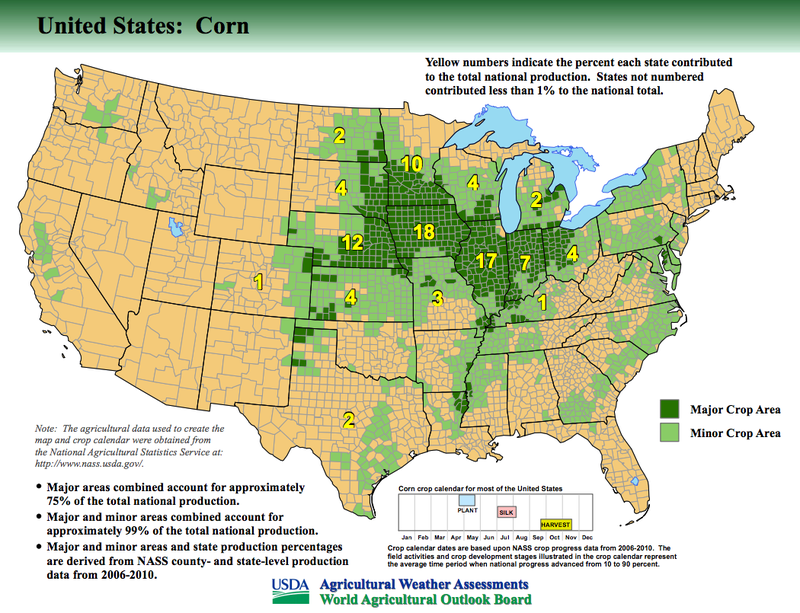 Despite rapid planting progress during mid-May across the Corn Belt, rains and cool temperatures since have delayed the completion of planting in parts of the western Corn Belt and raised the likelihood that seasonally warmer temperatures and drier conditions in late July will adversely affect pollination and kernel set in a larger share of this year’s crop. 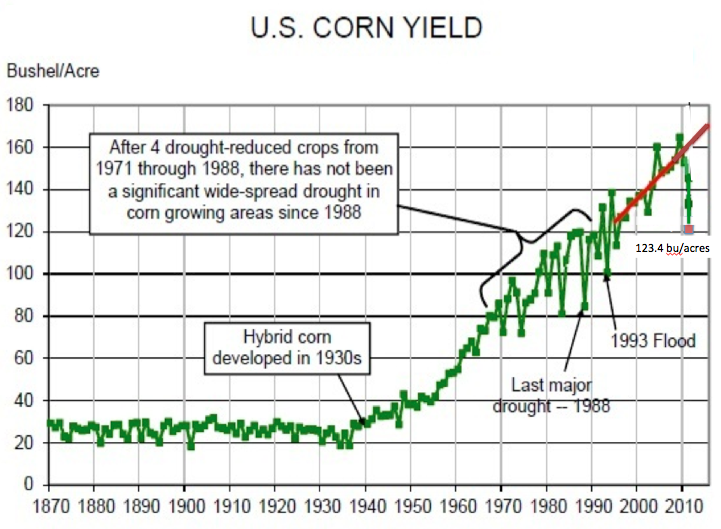 Still that yield would be 26.8% higher than 2012 and production up 29.9%. 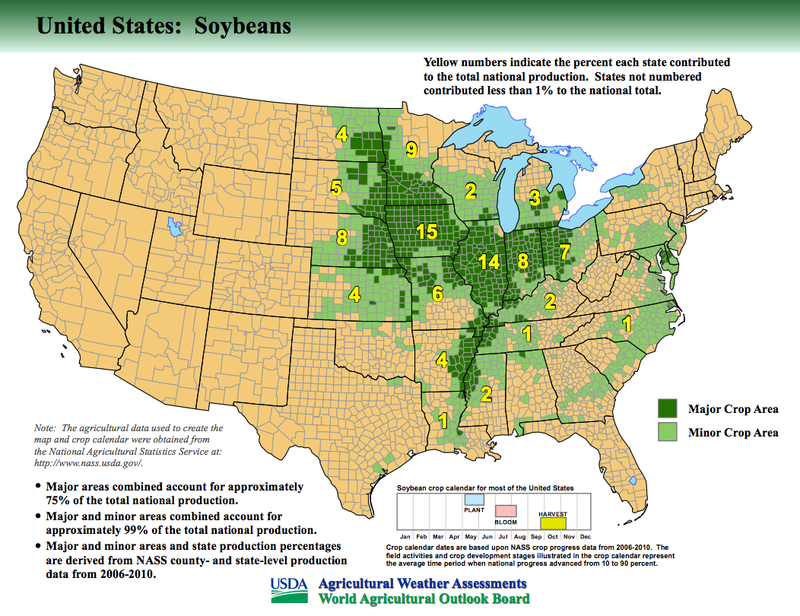 This does not account for acres abandoned due to delayed planting due to cold, late snows and flooding and acres intended for corn planting where beans were instead planted or replaced flooded corn. In the June 28 report, the USDA will adjust acreage and production accordingly. Joe D’Aleo is Chief Meteorologist for Agriculture at Weatherbell Analytics, providing global weather forecasting for grain and softs commodities. Joe and his co chief meteorologist Joe Bastardi who focuses more on energy, utilize natural factors to predict short, medium and long range weather. Between them they have 70 years experience. Go to weatherbel.com. for a trial. The two Joes both blog daily and post videos for weather enthusiasts as well as serve industry. All services include includes unique global modeling by Dr Ryan Maue and unique data and forecast portals.